I have finally gotten around to compiling the 2014 disabled list data. Usually I get this information out in October, but instead I was driving to and watching this unique event I have never seen live in Kansas City called postseason baseball. Crazy stuff. Now I can get back to the boring stuff involving spreadsheets and SQL. Besides compiling the 2014 DL data, I have dived into some other topics I have wanted to look at for while, such as historic team values, injury rates for various injuries–especially to pitchers–and how certain injuries affect a player’s performance.  At times, the following information can seem like just that, information. I started off on a few tangents but limited the amount of research. One such tangent ended up as entire separate article to be seen in the future here at The Hardball Times. If I did everything I wanted/could have done, I would have ended up with a small book, so I had to draw the line somewhere. I’m hoping people can find pieces of information to use to help explain the never-ending stories surrounding baseball. 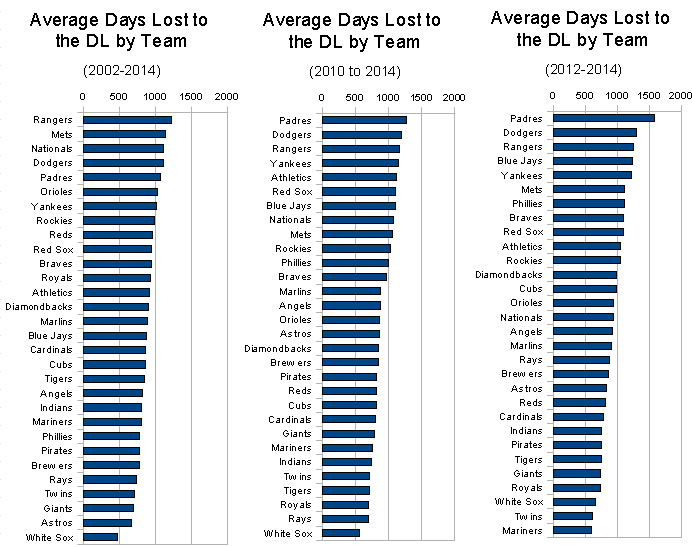 Let’s look at how each team stood in terms of number of trips to the DL and total days lost. I collected the 2014 data from the player transactions at MLB.com. 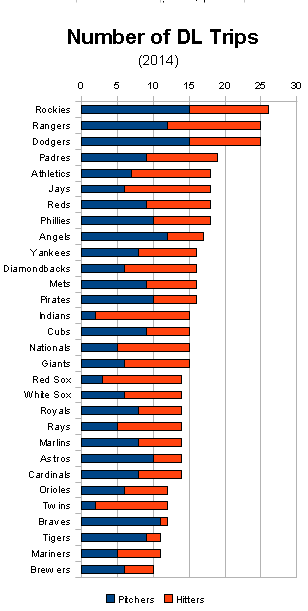 It, along with the 2010 to 2013 data, is available at Baseballheatmaps.com. Let me know if you find any discrepancies in the data. • Congrats to the Brewers for having the fewest number of DL trips. The Pirates had the fewest number of lost days at 409. • Now take the Pirates total, multiply it by five and it would still be smaller than the number of days lost by the Rangers. The Rangers total of 2,116 days lost was the highest total going back to 2002, 99 more than the Diamondbacks had in 2004. 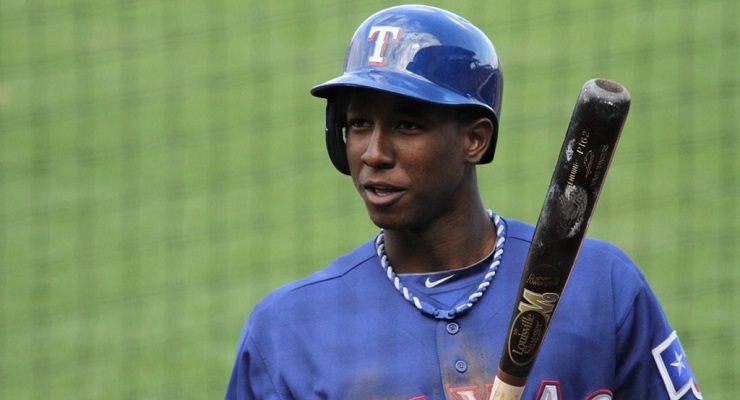 The Rangers just need to put the 2014 season behind them and look to the future. The Braves have the third-highest total, with the 2008 Orioles having the top value and the 2007 Mariners coming in second with zero hitters on the DL. The 2013 Yankees were the only team to make the top 10 with hitters being the higher value. The next team with hitter DL days being the higher category was the 2008 Nationals. Looking at the data, the days lost to hitters is lower in number and more consistent from season to season than the days lost by pitchers. Besides the league-wide numbers, here are the team totals from the entire time frame (2002-2014), last five seasons and last three seasons. • The White Sox’ dominance of not putting players on the DL finally took a small hit. They still hold the overall lead in least days lost, but over the past three seasons, the Twins and Mariners had the two lowest values. • Historically the Twins have had low DL numbers, and their values have stayed fairly constant. 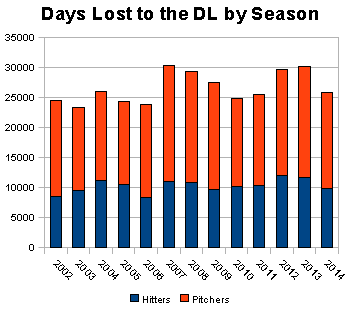 The Royals, Tigers and Indians have seen their number of DL days drop immensely. I wonder if they were able to copy the White Sox in some ways to keep their players healthy or if it was just a coincidence. The one item this group generally has in common is they have young pre-abitration players and not many old, injured veterans. • The list of the teams with the most DL days is filled with teams with large checkbooks that can afford old, declining stars. Well, except for the Padres; I don’t know what’s going on there–maybe too much Carlos Quentin. Old, veteran teams should not be surprised if quite a few of their players are DL bound. Besides the overall trends, millions of possible combinations could exist when comparing teams and the league-average values. Instead of creating even more graphs, here is one interactive graph that allows the user to select whatever team(s) he or she likes for comparison. I have set the initial view to the teams with the most, fewest and average days on the DL. 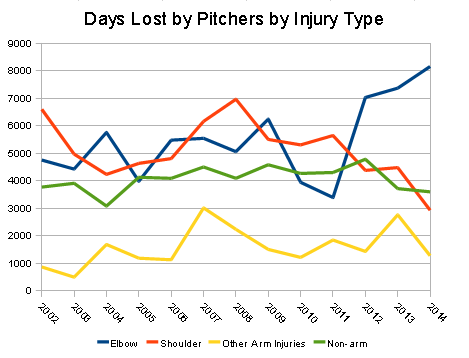 For pitchers, I had an inclination that shoulder injuries have been declining while elbow injuries are the rise. And it is true as seen here. Days lost to shoulder injuries reached almost 7,000 in 2008. In 2014, the total days lost was under 3,000. Much of this improvement can be attributed to better exercises for the muscles in the shoulder. So with the number of shoulder injuries down, something had to give. The number of days lost to elbow injuries went from about 5,000 days in 2008 to over 8,000 in 2014. The days lost just seem to be transferring from the shoulder to the elbow. The difference among teams is also staggering. Here are the number of days lost on or before 2008 and after 2008. Two major points stick out. First, the Astros, Blue Jays, Pirates, Mets and Yankees need to figure out what the other teams are doing to improve shoulder health and get on board. Second, what are the Orioles doing to improve both shoulder and elbow health? Dave Brown asked Buck Showalter about this trend; here is some of what he said. There are some ways that you can reduce your risk factor. A lot of it has to do with long before you get them, with all of the abuse they get from some of these travel teams around baseball. We’ve just been real consistent. In our situation, knowing who we are and what we can and can’t do with player acquisition (relating to money), we have to be able to grow our own pitchers. We have to be able to protect them, and we’re not going to stray from that. It’s just like, we’re going to teach a guy to throw a change-up or have better command of a fastball, and we’re also going teach him how to be as healthy as you can. Because I’m in charge, as a lot of people are, of protecting our commodities. Not that ours are any more precious than anybody else’s, but this is where we’re going. These are our pitchers. If we can keep them healthy, we’re a better team. We’re not reinventing the wheel. I just think our whole organization has stayed very consistent through it. We may have a year, next year, where it doesn’t happen that way. It’s kind of cyclical. But we’re trying to do everything we can to be consistent. Our pitching coaches in the minor leagues have been consistent from top to bottom with managing innings and managing pitches and exercises that we do to try and eliminate as many problems as you can, knowing that you’re not going to fully solve it, ever, until you change the anatomy of the arm and put it where you walk around like this (waves arms straight over head). Baltimore has sent players to the DL around 350 fewer days over the last six seasons than the seven before them. The team is doing something right. This is a study I have wanted to do for a while: compare the results of different injuries from the season before to the season of the injury and the season after. I grouped the data by different body locations and by time on the DL (more or fewer than 30 days). I easily could have divided the data into more specific injury types, but for now I lumped the data into large groups. To examine the data correctly, I needed to create some baseline aging factors. Most of the players headed to the DL are older and on the downward slope of their careers (average age around 29). 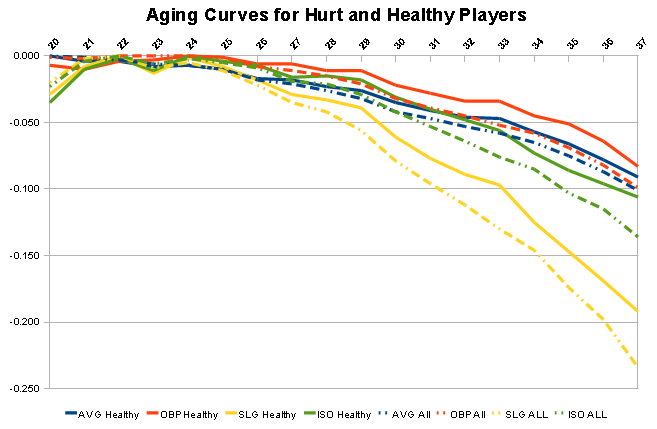 I created aging curves for players who never spent time on the DL between the two ages in question. Here is the aging curve of players who were not on the DL at either age and the entire population. …survivor bias, an inherent defect in the delta method, which is that the pool of players who see the light of day at the end of a season (and live to play another day the following year) tend to have gotten lucky in Year 1 and will see a “false” drop in Year 2 even if their true talent were to remain the same. This survivor bias will tend to push down the overall peak age and magnify the decrease in performance (or mitigate the increase) at all age intervals. The key numbers to take from the above graph are the healthy values around the average age of the players being examined. Starting with hitters, I looked at how their batting average, on-base percentage, slugging percentage and isolated power change in three different ways. Using the overall numbers (available here), hitters performed worse in the season they were injured than the season before because…WARNING: ROCKET SCIENCE…they were hurt. The key, then, is how much they will bounce back once healthy. Here is how hitters over- or under-performed their age-adjusted OPS comparing their year-before season to their year-after season. • Arm issues have the largest effect on short stays and elbow on long stays. Elbow injuries would include Tommy John surgeries, so it’s apparent why such injuries would require longer stays. Arm, elbow and wrist issues seems to have more of a long-lasting effect than other injury types. • Head issues, which are mainly concussions, have more of an effect on the players’ continued production after a short stay versus a long stay. • It is interesting that players who take time off for groin issues see a huge improvement. I wonder if the players suffered through the problem for more than one season before finally dealt with it. Now on to pitchers. For them, I looked at walk and strikeout rates, ERA and fastball speed (FBv) over the same three time frames for pitchers. 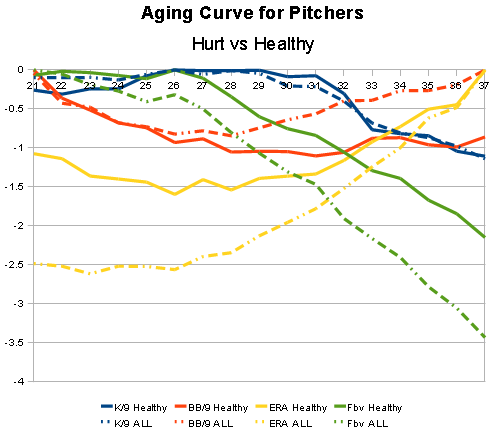 As with the hitters, I created an aging curve for both healthy pitchers and the overall population. Knowing that pitchers will be on the decline even if they don’t go on the DL, here are the age-adjusted overall numbers from the year before the injury to the year after (wrist, head and neck injuries were removed due to lack of information). Full list available here. • Looking at the overall numbers, it’s no surprise seeing pitchers performing worse after injuries than before. • Concentrating on the leading causes of time missed, elbow and shoulder issues, shoulder injuries seem to linger the longest. If a pitcher spends 30 days on the DL for an elbow injury, he comes back almost the same as before the injury. A short shoulder stint seems to be a sneaky issue, with an additional 0.36 increase in ERA and worsening of BB/9 and K/9. However, with velocity staying constant, the injury may be masked. Every time I look into injury data, I find something I never knew before. This time was no different. Injury effects is one of the few under-analyzed areas in the sabermetric community, and one with much to gain. I hope Iwas able to shed some light on the subject. Thanks to Bill Petti for helping with the team comparison Tableau Table. Thanks to Dave Brown for the Buck Showalter interview. Thanks to Morris Greenberg for his assistance in compiling DL info. On days lost to the DL for the 2014 season, the top seven teams on the list are all in the Western Division. Coincidence? Or travel/time change issues? 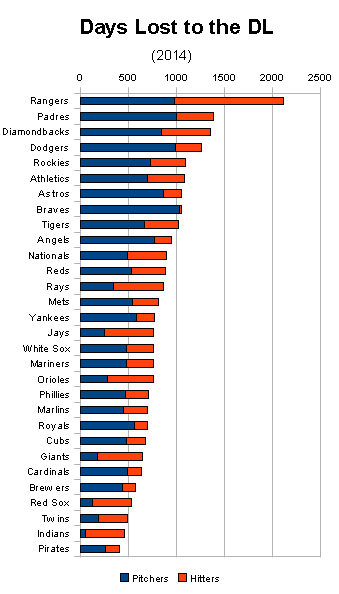 The Rangers probably travel more miles than any other team (at least prior to the Astros coming into the division). Actually, the Mariners traveled the most last year… Here’s a breakdown of the 2014 travel schedule. Rangers were’t really close to the top. One tangent I had after reading – do you know if anyone ever attempted to analyze days missed immediately before a DL stint, where a player is presumably injured but not yet determined to require a DL trip? I’m not sure it would change the bulk of your analysis, but I wonder if the team-by-team variations might have anything to do with a team’s philosophy on using the DL. Is the DL data spreadsheet going to be posted like previous years? Great work, BTW. There is a link in the 3rd paragraph. The link only has 2010-2013. Jeff, for the pitcher charts, when you say “age-adjusted,” do you mean that you are adjusting for the normal decline that ALL pitchers have or just the healthy ones? IOW, if a pitcher sees a .5 increase in ERA before and after an “injured” year, we can assume that he is .5 worse than he would be if he were not injured in that middle year or .5 worse than an “average” pitcher including healthy and injured ones? Just the ones which didn’t go on the DL in either season. This is amazing! I would love to see the spreadsheet of healthy pitchers used to make the aging curves. Especially if it’s possible to see who has avoided shoulder and elbow injuries in particular. I would like to know where to find league-wide MLB DL use data by season from say 1970 onwards. I don’t remember clubs back then utilizing the DL like they do today, and I would like to know if the actual stats bare that out. Any help anyone can provide would be appreciated. Thanks! Do you play for the Washington Nationals?